Today, January 6th 2011, my cousin, Joan Bechem-Agbor Arrey, will start her final journey to her resting place in her husband’s village in Akak, Manyu Division, Cameroon; another victim of the dreaded disease, Breast Cancer. Joan was only 34! It was actually a few days ago, on the 24th of December, Christmas Eve, when I kissed Joan and wished her, a safe trip to Cameroon. The United States health care system had done its best and come to the end of what they could do. Her dedicated sister-in-law, Mrs. Christy Arrey Akoachere and her husband had done their best too and re-defined the notion of “in-law-ship”, but even they had to come to terms with the fact that they could do no more. 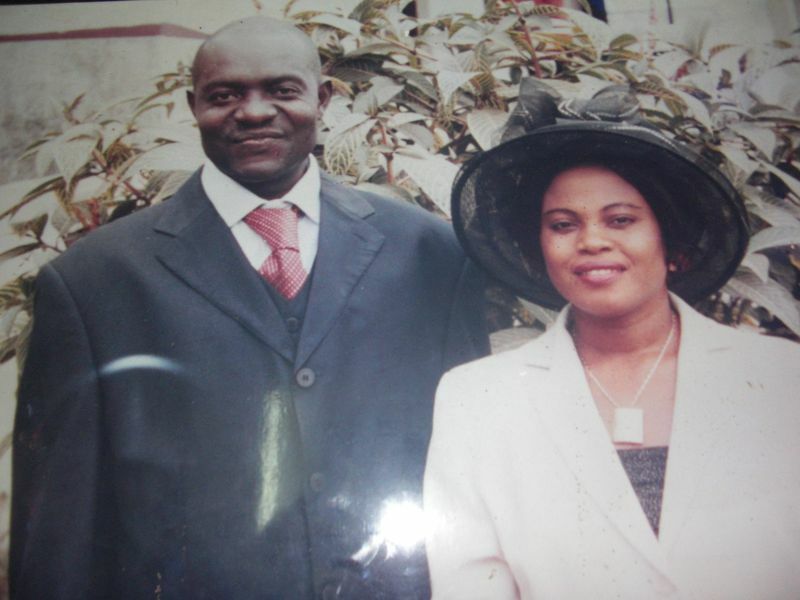 Our greatest wish now was to see Joan reunited with her husband and family in Cameroon. Her husband Mr. Johnson Arrey had visited her in the summer and was hoping for a better outcome but things went downhill unexpectedly. It was a painful separation when I took leave of Joan as she left for Logan Airport. In fact, it was a slow two hour plus drive back to West hartford, Connecticut. My wheels rode on the lines of my tears as I drove to my kids who were innocently waiting for their mom to make christmas happen. Joan and and her husband in happier times! The last time I saw my cousin Joan before this time must have been when she was probably around eight years old. I was not in Cameroon when she blossomed into a beautiful woman, earned her degree from University of Buea, and became the respectable wife of Mr. Johnson Arrey, Delegate of Land Tenure and State Properties, Meme Division, Cameroon. I might have missed seeing Joan when her outer beauty was radiant but I thank God for bringing me close to her when her inner beauty shone like a light house. Joan, known as Mbockayah, to her family members, faced the disease that ravaged her body with fortitude and calm. It must have been God’s design that I should meet with her at this time because she gave me gifts I will always treasure. When a young woman of 34 is told that she has come to the end of her life, after being married for close to ten years with no child of her own, what is she supposed to do? I had just entered Joan’s room in the hospital where I met her and her doctor in conversation. She told the doctor that I was her sister, and she wanted me to remain in the room. The doctor was trying to discuss her needs in case of any eventuality while he was on call. He claimed she did not have anything on file and for a patient in her state it was a must. The doctor saw that I was getting emotional and asked me if I could step out. I did. When I came back into the room, my cousin turned to me and said in a calm voice “sister, I have accepted it. I just want to go in comfort, no machines”. I usually don’t lose my voice but for a few minutes I had nothing to say, and I can’t even remember what I said afterwards. She then got into conversation, telling me about my friend from Concord, MA, who had visited her a couple of times on my behalf and even smiled several times in the process. She put me at ease and I started chatting. She gave me back my voice which I used to tell her funny family stories. I had come to give her strength; she in turn gave me strength. She had come to terms with her own death and wanted me to come to terms too. This was December 17th 2010. By the time I left her we were smiling and I even asked one of the nurses to take us a picture. This picture is frozen in my mind, and I pray that God should grant me the same fortitude when my time comes. 12/17/10: Joan in hospital smiling in spite of it all! 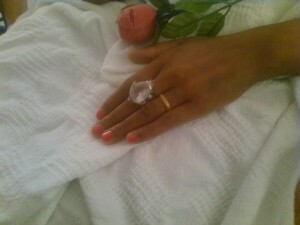 Notice the ring on my finger which will lead to the other ring. We do not choose our family members; this is a divine occurrence which must not be taken lightly. It must be the sacred nature of that bond that led me to rush to Leominster Hospital, MA, on December 23rd to spend the night with Joan. It was her last night in the USA. Her indefatigable sister in-law, Mrs. Christy Akoachere and her mother Mama Flora Arrey, who had been taking care of Joan needed the night off to prepare for the tedious trip that lay ahead. Mrs. Akoachere had been running around the whole day getting everything ready for Joan’s trip, from medications to cross-checking her special accommodations with the airline etc etc. Mama Flora Arrey, who was accompanying Joan to Cameroon, needed to rest for the long journey. She had spent the last couple of nights by her daughter-in-law’s bedside. When I arrived that night from Connecticut it was a welcome relief. 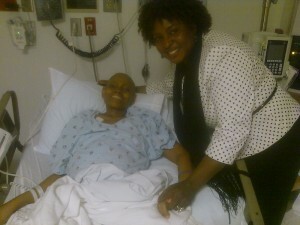 Without any prior arrangements, My cousin, Kima Victor joined me in hospital straight from work. We sat by Joan’s bedside and reminisced over family occurrences, which the Bayangis refer to as “veh ya vebi”, until he left at about 10pm. My vigil alone with Joan began in earnest. That night, I learnt to love all over again, the kind of love that does not expect anything in return; the kind of love that wants to give and keep giving. I looked at my cousin and could see that life was slowly slipping from her. As her closest blood relative around I wanted to give her the love of our whole extended family. I knew I was racing for time as I called close members of our family including her fathers and sister in Cameroon to talk with her. Even when she was too tired to talk back I urged them to talk in her ears for she could hear. I wanted her to reach Cameroon to see her husband, family members and friends but I was worried sick about the long trip via France to Cameroon. The airline delays caused by the heavy downpour of snow did not make things easier. Several times in the night when she was alert, I would repeat in Kenyang “tang nteuh, chong woh gagha ogho-gho” which loosely translated means “Be strong; you will arrive; do you hear me?” and she often responded with a slight nod of the head. If only love was this simple! Wearing the ring, that said it all! There’s nothing more to say. I wipe away tears but I am happy for Joan. She arrived Douala, Cameroon, alive on Christmas day as she had wished. She was received by her husband, father, siblings, uncles and other close family members. She made it to her place of residence, Kumba, and died peacefully the next day, December 26th at Eben’s clinic. On Saturday Joan will be buried in Akak, Manyu Division. She is at rest now, and I can only be grateful for the beautiful gifts she handed to me before dying. Adieu, my beautiful one, my regards to our extended family over there! Thanks Evy, that’s the right thing to do. As I say in my post, “We do not choose our family members; this is a divine occurrence which must not be taken lightly.” Maintain the family love. Blessings! This story brings back to my heart the feeling that love is an amazing gift which is around us but most times we choose not to see it. I had blinded myself from the love around me and stayed with anger in me. But reading this reminded me that, time is never enough to share love with each and it is only best that the best is made out of every little time that we have. Thanks Doctor,for sharing this piece of yours. You are welcome! Let’s give and receive love!